The recent condition of the Crude Palm Oil (CPO) production of Indonesia is that it becomes the number one in producing and the number two in exporting all over the world. However, in the other hand, there is a need to develop more its derivative products. It means the tendency to export has to be given a brake a bit in order to ensure the availability of CPO as the raw material for its downstream products. The availability is not only for the production of cooking oil made of palm oil as basic need for Indonesia society but also other derivative products that give more value added, employment, and Gross Domes-tic product (GDP). Most of the instrument has been used by the government for that purpose is by levying CPO export tax. 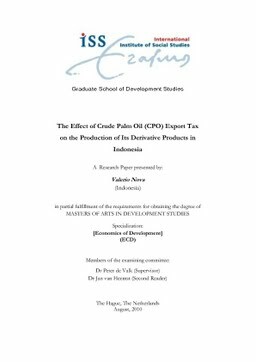 Therefore, there is a willingness to examine how far export tax affects the development of CPO derivative products in Indonesia. This research examines three oleo chemical products which are fatty acid, fatty alcohol, and glycerol as the representative of derivative products in Indonesia with the period from 1997-2007. The analyses used are by using descriptive and regression-based analyses. The descriptive analysis is using graphs and regression-based analysis is using panel data analysis specifically Fixed Effect Method. The main conclusion got is that there is no significant effect of export tax on the derivative products production.